Houston Rockets' Jeremy Lin made an appearance and talked with fans at Golden State Warriors Asian Heritage Night. We will be posting images and more. Stay tuned! Lin's appearance at Asian Heritage Night event is hosted by the Golden State Warriors and Cache Creek Casino Resort, February 12 when the Warriors play against the Houston Rockets at Oracle Arena in Oakland, California (7:30 p.m. PST). The event will also be aired live to China on CCTV. NBA Entertainment will produce a live feed capturing the February 12 in-arena celebrations, events and activities to air live in China on CCTV. The Warriors Asian Heritage Night is part of the NBA Chinese New Year Celebration 2013, its largest international tribute ever from February 7-14. 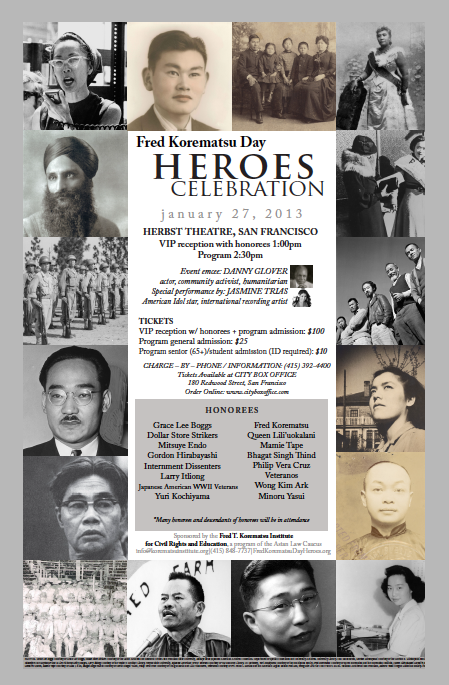 WHAT: The Korematsu Institute celebrates Fred Korematsu Day 2013 by honoring 16 American civil rights heroes who’ve been long overlooked (see list below). This will be a historic gathering of civil rights heroes and the descendants of heroes who have passed on. The event also features celebrity emcee DANNY GLOVER, as well as a special performance by American Idol star JASMINE TRIAS. If you are as talented as designer Jason Wu, lightning can indeed strike twice to your career. First Lady Michelle Obama arrived to the Commander-in-Chief inaugural ball last night wearing his stunning ruby red gown, marking the second inaugural she chose to wear one of his creations. From the homepage click here to view Jason Wu's full length inaugural gown. In 2009, at the first inaugural she surprised fashinistas by wearing a gown he designed, a flowing cream-colored shoulder-baring confection. Jason, then a 26 year old rising-star designer had submitted his dress he had created for her consideration, just as other designers have customarily done. In 2009, the moment First Lady Michelle Obama appeared in Wu's ball gown, was the moment his already fast-rising career launched into hyperspace. Designers were glued to the television watching the inaugural events to see what Mrs. Obama was wearing hoping it would be from their designs. Wu, 30, was watching the inaugural events on television with his staff in New York City. Mrs. Obama appeared in Wu's flowing, belted chiffon and velvet red gown as she joined her husband onstage for their first inauguration dance at the Commander-in-Chief Ball. Wu told the New York Times, "I'm still floating." "It is a big surprise. The White House kept us pretty clueless until five minutes ago." 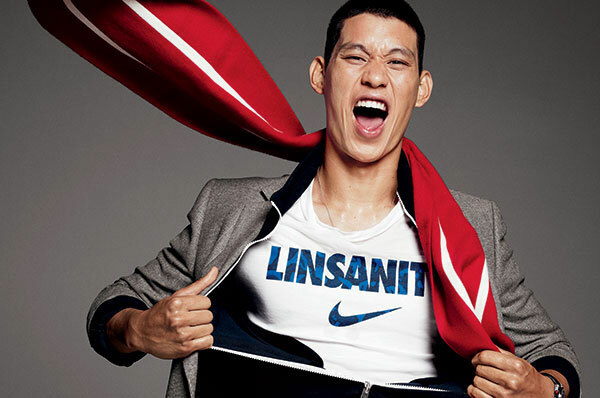 Wu was born in Taiwan, moved to Canada when he was 9 years old, and graduated from boarding schools in the U.S. He attended Parsons The New School for Design in New York City. It is an honor for a fashion designer to create an inaugural gown worn by a First Lady. 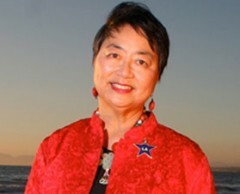 Wu's ruby red inaugural gown is now planned to go to the National Archives. Mrs. Obama's 2009 creamy-white inaugural gown designed by Wu was donated to the Smithsonian. Hideki Matsui announces his retirement - "Godzilla" to baseball fans in Japan and U.S.
Hideki Matsui announced his retirement at age 38 on Thursday in Manhattan. Known as "Godzilla" to baseball fans in Japan and U.S., the 6 foot 2 inch, 210 lb. athlete has had an illustrious career in both countries. He was named World Series Most Valuable Player in the U.S., and three times was named the Central League Most Valuable Player Award in Japan. He played seven seasons from 2003-2009 for the New York Yankees, and ten seasons for the Yomiuri Giants of Japan's Nippon Professional Baseball. He had a $52 million dollar four year contract with the New York Yankees through 2009. Matsui helped the New York Yankees win the World Series, defeating the defending champion Philadelphia Phillies earning him the World Series Most Valuable Player Award. At the end of 2009, Matsui agreed to a one-year $6.5 million dollar deal with the Los Angeles Angels of Anaheim. 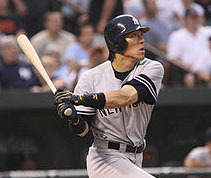 In addition, Matsui played one year stints with the Oakland Athletics, the Los Angeles Angels of Anaheim, and the Tampa Bay Rays. He was a basebal outfielder and designated hitter, batting left-handed and throwing right-handed. American war hero and distinguished Senator Daniel Inouye has died at the age of 88 of respiratory complications at Walter Reed National Military Medical Center in Bethesda, Md. "Tonight, our country has lost a true American hero," said President Barack Obama. Senator Inouye was the second longest serving senator in the U.S. and was awarded the Medal of Honor for his World War II heroics. He was a member of the U.S. Army's 442nd Regimental Combat Team, the most decorated unit in U.S. history.